Dr. Mary Neal is a board-certified orthopedic spine surgeon who drowned while kayaking on a South American river. She experienced life after death. She went to heaven and back, conversed with Jesus and experienced God’s encompassing love. She was returned to Earth with some specific instructions for work she still needed to do. Her life has been one filled with the miracles and intervention of God. 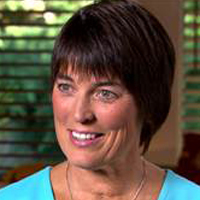 Her story gives reason to live by faith and is a story of hope. Dr. Neal was born and raised in Michigan and graduated from the University of Kentucky before attending the UCLA medical school. She completed her orthopedic surgery training at the University of Southern California after which she lived in Sweden, Switzerland, and Los Angeles while undergoing 1 1/2 years of specialty training in spinal surgery before becoming the director of spine surgery at USC. Five years later, she left the University for private practice. “In 1999 in the Los Rios region of southern Chile, orthopedic surgeon, devoted wife, and loving mother Dr. Mary Neal drowned in a kayak accident. While cascading down a waterfall, her kayak became pinned at the bottom and she was immediately and completely submerged. Despite the rescue efforts of her companions, Mary was underwater for too long, and as a result, died. “To Heaven and Back is Mary’s remarkable story of her life’s spiritual journey and what happened as she moved from life to death to eternal life, and back again. 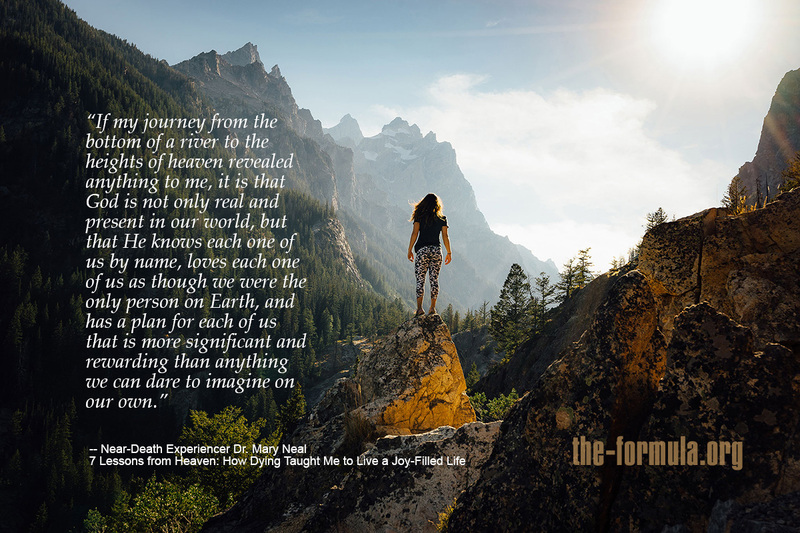 Detailing her feelings and surroundings in heaven, her communication with angels, and her deep sense of sadness when she realized it wasn’t her time, Mary shares the captivating experience of her modern-day miracle. 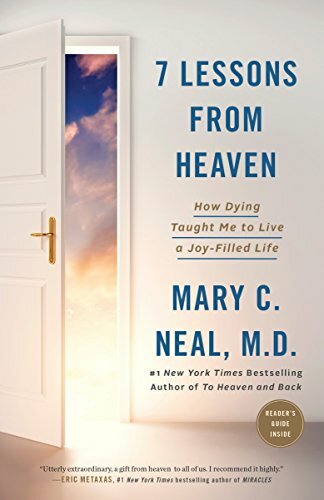 In this inspired follow-up to her million-selling To Heaven and Back, Dr. Mary Neal shares untold stories about her encounters with Jesus and powerful insights about how the reality of heaven can make each day magnificent. Dr. Mary Neal’s unforgettable account of a 1999 kayaking accident that took her life, and what happened next, has riveted more than a million readers. But something happened as she shared her story in the years since. Not only did Neal realize she had more to tell, she discovered she had yet to answer the biggest question of all: How does knowing heaven is real change our lives on Earth? “I have never finished speaking at a venue, including corporate settings, without people wanting to know more,” says Dr. Neal. In 7 Lessons From Heaven, Neal takes readers deeper into her experience, which includes encounters with angels, a journey to a “city of light,” and what it was like to meet Jesus face-to-face. Even more, Neal shares how she was sent back with the absolute knowledge that the God we hope for — the one who knows us, loves each of us as though we are the only one, and wants us to experience joy in our daily life — is real and present. She offers practical insights and inspiration for how each of us can experience this God every day and begin living without regret, worry, anxiety, or fear. 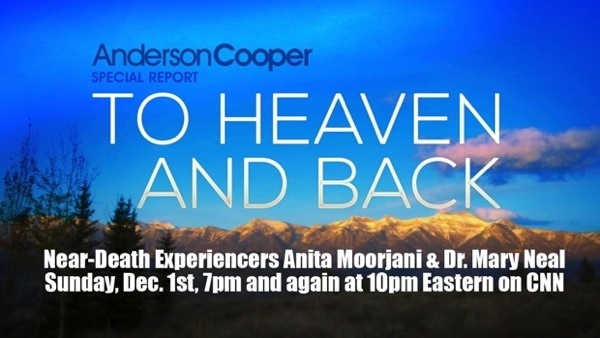 Click here for information about the December 1, 2013 one-hour special report that CNN ran on NDErs Dr. Mary Neal, Anita Moorjani, and Benjamin Breedlove. Let’s get right to the point: What happened to you? As background, my husband and I are avid outdoors people and very athletic. We’ve been kayaking for many, many, many years. We have kayaked on rivers throughout the United States, and we’ve kayaked internationally. So we decided to go to Chile to kayak with friends who are professionals—they run a raft and kayak company in the United States, and during the winter, they run trips in Chile for Americans. We decided to kayak a section of a river that’s well-known for its waterfalls, and by that I mean drops of ten to fifteen feet. These are challenging for a kayaker, but they are not unreasonable, and they were certainly within our skill set. We put in with four of these professionals and a few other Americans (though my husband couldn’t go that day because of back problems) and went over a couple of drops. It’s a fairly wide river with tremendous volume, tremendous flow. We decided to run this one smaller chute. The person who was kayaking ahead of me went toward it but got turned so that her boat was temporarily stuck. I was already in the current, so I was committed. I veered off to the left to avoid her and went over the main drop, which, as I said, had tremendous flow. As I went over the top, I could see the bottom and that there was no clean exit . I assumed that I would hit the bottom, flip over, probably not be able to right myself, and then would pull the spray skirt off, push myself out of the boat, get tumbled around a bit, and spit out downstream. This is never an enjoyable experience, but it’s certainly part of kayaking. It wouldn’t have been the first time that it happened. When I hit the bottom of the waterfall, the front of my boat became pinned in the rocks underwater. I and my boat were completely submerged in the water — probably eight or ten feet under. One of the guys who ultimately tried to find me actually kayaked right over me and didn’t even know it. You must have been terrified. In fact, when this happened, I was very calm. I’m a spine surgeon. I’m used to high stress situations. And I’ve certainly been under water plenty of times in my boat. I immediately started to do the things that would either free the boat or extricate me from the boat. I tried to jiggle the boat. I tried to reach back and pull my spray skirt off, things like that. But the volume and force of the water was such that my torso was absolutely pressed to the front deck of the boat. I couldn’t move at all. I am very much a pragmatist. I recognized my predicament. I knew that I was too far from shore for anyone to get there. And I also have seen a couple of people drown in waterfalls in the years I’ve been kayaking. So I knew that even if they could get to me, the likelihood of their being able to get my body out of the boat in time was pretty slim. Still, I didn’t panic and say, “Oh my gosh, God, get me out of this!” I made a conscious decision and asked only that God’s will be done. Given your phobia, that’s an unexpected response. At that point in my life — and probably for the first time — I sincerely gave up trying to control the outcome. I had many times prayed for something and then said, “Your will be done,” but I don’t think many of us actually mean it. We want God’s will to be done as long as it’s in line with what we want. I think it’s a very, very different thing when you begin to give up control of the outcome. At that point, I gave up control of the outcome. And the minute I said that, I was immediately overcome with a very physical sensation of being held and comforted and reassured that everything was fine. My husband would be fine. My young children would be fine whether I lived or died. It was that word fine. It wasn’t happy or great, but it was fine. I believe Christ was holding me. It took me a long time to say that to other people, because it seems presumptuous. Why would Christ be there to hold me? But this recognition was actually one of the profound aspects of this experience. I don’t have the words to explain how it happened. But I recognized that Christ was holding me, and Christ would hold anyone who asked. Then I went through a little bit of a life review — not so much looking at events in isolation but looking at the unseen ripple effects of those events, how an event had an impact not just one or two degrees removed but 16, 20, 25 degrees removed. This was another profound aspect of the experience. It made me truly understand that every action, every decision, every choice, every human interaction really does matter. You may not know it, and almost always you don’t recognize the impact. But everything really, really does matter. What were you thinking when all this was happening? I was still quite aware of my situation. I’m a cynic. My little thought balloon off to the side was taking all this in and thinking, Gosh, this is really curious. This is crazy. I knew that I’d been underwater too long to be alive, but I felt more alive than I’ve ever felt. It all felt more real than anything has felt on earth. But I could still feel the water. I could still feel my boat. I could feel the current slowly pulling my body over the front deck of the boat. In doing so I could feel my knees bend back and break and the ligaments tear. But I had no pain. I had no fear. I had no terror. I felt great. And so I was thinking, Gosh, this is really, really something else! Then I felt my body break away from the boat, and as my body was coming out of the boat, I could feel my spirit peeling away from my body. I rose up and out of the river. I was immediately greeted by a group of beings, spirits, people. I’m never really sure what to call them, because those words mean different things to different people. They were so overjoyed to see me and welcome me and love me, and I knew that they had known me and loved me as long as I existed. I knew — and when I use that word know, it’s a very different sense of knowing — I knew at an absolute, core level that they had been sent by God and were from God and were there to welcome me and guide me and protect me. People have asked, “Protect you from what?” I don’t know. I only know what I know. I don’t know what they were protecting me from. What made you sense that they were like “people”? They had physical form — head, arms, legs — and they were wearing something like robes. They were absolutely brilliant, radiating. And they were exuding this incredible love. What else were you seeing at this point? As we were going down the path, I could simultaneously look back at the scene on the river. I could see my body being pulled ashore, and I could see a guy start CPR, and I knew that it was on me. And I looked at my body fondly and thought, Thanks, that was a good ride. See you later. One of the guys doing CPR kept looking up, and I thought he was looking right at me. He kept calling me to take a breath. Eventually I’d be overcome with compassion and go back and take a breath, and then I would leave again. It was very interesting to talk to him later, because we were both equally irritated with each other. I wanted to strangle him because he was interfering with my progress, and he wanted to strangle me because I would take a breath, and then I’d stop breathing again! And the cycle would keep going. So it was interesting to corroborate that sequence of events later. I was also absolutely overcome by the sense of being home, of being where I truly belonged. And I was surprised by the fact that I was not coming back. I love my husband dearly. I love my children more than I could ever imagine loving something on earth. But in comparison to God’s love, the love I feel here is pale. I mean, I was home. I knew I’d had a great life to that point, and I was surprised that I had absolutely no desire to return. I still feel a little guilty saying that. I didn’t talk about this for many years partly because until my kids were old enough, I would not have wanted them to hear me say that. Out of context and before you have understanding — for a kid to think that they’re not enough of a reason to come back is terrible. But at that point, I could hardly wait to get to the threshold of God’s kingdom of heaven. Did you ever get to the threshold? Eventually we did get to the big arched entryway, and inside I could see many, many other spirits, angels, people — I don’t know what they were. They were all running around. They were all very busy, and I’m not sure what they were doing, but I knew that they were busy doing God’s work. When I arrived they looked up and had this same sense of absolute joy at my arrival. Another profound part of the experience — and again, I can’t explain it using three-dimensional language: During that time, it became absolutely clear to me that these people were joyful not only at my arrival but at the arrival of every person who shows up. More importantly, I understood how God can actually know each one of us, love each one of us as though we were the only one, and can have an incredible plan for each one of us. That’s something that before this experience was difficult for me to grasp. But during this time, it became absolutely clear to me how that can be, and how all of God’s promises are true. So, I was ready to dive across that threshold. But as I was pushing to do so, the spirits who had taken me there said that it wasn’t my time, that I had to go back to my body and back to earth, that I had more work to do. And I said, “No, I’m not leaving!” I think this was the only reasonable thing to do! You got it wrong, I thought. You can’t make me do that. But they did give me some information about some of the work I still had to do, and they took me back to my body. And I was reunited with my body. What happened at the river at this point? The guys strapped me to the top of a kayak and started carrying me. One guy had a machete and started hacking a pass through the bamboo hillside. It was the typical three steps forward, two steps back kind of thing. And it took a number of hours, and finally they found a little animal track and started following it for several hours. It took a number of other miracles to get me home. And once home, it was touch and go. Then I was in ICU and everything was blurry. And I couldn’t read anything. I couldn’t watch TV. I couldn’t have a conversation, because I couldn’t focus on anything. I finally asked for a Gideon Bible, and I looked through the Psalms or some verses like “Give me strength,” that kind of thing. But I couldn’t read anything. I kept flipping through and getting frustrated. It was very boring, as you might imagine. At this point I had no pain still, despite the multiple fractures and torn ligaments. I had no pain for almost a week and a half. I really felt like I had one foot in this world and one foot in God’s world. And then throughout that day, the next two verses came into clarity. “Pray without ceasing,” and, “Give thanks in all circumstances, for this is the will of God in Christ for you.” Those three verses were all I could actually look at for several days. And then once, when I was contemplating, I had another — I don’t know the words to use — out-of-body experience, when I felt that I was back in God’s world. I was still in ICU. I was in this incredibly beautiful field. Again, it was a beauty of an intensity that doesn’t exist here on earth. It was as though you could look at a color and not only see it, but you could feel it and taste it and hear it and experience it. It’s almost as though you could see the life within the color, or the essence of the color. It’s not something I have the words to describe. But again, it was this hyper-real, sun drenched field. I was sitting on the ground, and I believe Christ was sitting on a rock conversing with me. Again, it took me a long, long, long time to be willing to say that to other people. Why would Jesus chit-chat with me? But the fact is, the way it works with this different sense of time and space, he’s there for each of us. The reality of that can make me cry just thinking about it now. He really is there for each of us. We talked about a number of things, and during that time I was also given a little more information about the expectations for my life, including my expected role at the time of my oldest son’s death. And then a mandate to share my experiences, helping people face challenges with hope, seeing them as opportunities for spiritual growth — inspiring people to seek God and develop or deepen their relationship with him. What were your initial impressions of these experiences once you began to heal? When I was back in my ICU room, I thought, That’s incredible. I must be getting some great drugs. I called the nurses and asked them what I was getting, and they told me I was getting only antibiotics. I did go back over my medical records later, and I wasn’t getting anything. I really didn’t have pain. I spent a number of months trying to think about my experiences, and I tried to come up with an alternative explanation, because I’m probably more cynical than most people. I certainly questioned my own experiences. The easy explanations — dreams or hallucinations — I could discount quickly, because my experience — and the experience described by anyone who’s had a near death experience or other experiences that involve God directly — is different in quality and memory from a dream or hallucination. It’s just entirely different. The memory is as precise and accurate now, years later, as it is when it’s happening. So then I thought it must be due to chemical changes or chemical releases in a dying brain. I did a lot of reading about that. If my experience had lasted five, six, seven minutes, maybe even eight minutes, I am sure that no matter how real it seemed to me, I would have said that’s a reasonable explanation. But the people who resuscitated me would say that I was without oxygen for up to thirty minutes. It took them ten or fifteen minutes to figure out, first, that I and my boat were both missing. Then once they identified where they thought I was, they started their watch. They’re used to doing this — you have to know the timing so you can recognize whether you’re trying to rescue someone or you’re trying to go for body recovery. So on the watch it was fifteen minutes, but about thirty minutes in all. I tend to stick with the fifteen minutes, because that’s an absolute timing. But even at fifteen minutes, that is way longer than can be explained by a dying brain. The human brain can hang on to oxygen for maybe five or six minutes, and so even if you give it another four minutes to go through its dying process, that still doesn’t add up to fifteen minutes. And so after I looked at all that, my conclusion was that my experience was real and absolute. I would think this might have left you feeling lonely at times, especially given your reluctance to talk about it. Who could possibly identify with your experience? I felt apart. I felt different. I felt, as you say, there was really no one I could talk to who had any understanding of what I’d been through. I found it difficult to go to Bible or group studies. Often people would talk about how God’s love is great, about heaven and all of that. At such times, I would find myself pulled more into that realm, and out of the earthly realm. I had to be very protective of how much time I allowed myself to think about my experience or dwell on it, because, while on earth, our focus needs to be on God’s business and figuring out what we’re supposed to be doing, and then do it. That was always hard for me. It was also a great example of how God’s timing is always perfect. I spent those ten years feeling guilty that I hadn’t fulfilled this expectation. But I finished what I thought was a final manuscript only a few hours before my oldest son was killed. And that [timing] was such an incredible gift, because, as I said, I’d been very protective of how much time I thought about my experience over the years. I’m not sure if that would have been true if I’d written it five years earlier, eight years earlier. There’s no question that the overriding mandate was to share my experiences and really try to use that to inspire people to find God. Many Christians remain skeptical of near-heaven experiences like yours because so few people experience judgment or hell-like conditions. Instead, all manner of people, even non-Christians, are overcome with a sense of God’s unconditional love. Well, first, I would say that I know what I know. I know what I experienced. And I am not going to pretend to know what I don’t know or didn’t experience. I don’t know what other people’s experience would be. Mine was a Christian experience. There’s no question. There are people, very few people — and those people are even less motivated to talk about it — who have experienced a hell or a darkness, an emptiness. That wasn’t my experience, and so I don’t know anything about it. God is way greater than anything we are able to conceive of. I think human beings want to create a box and put God inside the box, because that way they can define God and control the outcome. But I’ve come to realize that God is way bigger than that. God truly loves every one of us, even the people that we don’t love and don’t think should be loved. God loves that person just as much as he loves us. But God knows the heart of each one of us, and the God of the New Testament is not going to turn his back on a person who, for circumstances out of their control, has not developed that relationship in the here and now. It is outrageous to think that a just and loving God is going to turn his back on the person who is so mentally handicapped that they don’t even know what you’re talking about when you talk about faith. Or the young altar boy who is so in love with God but gets abused, and he turns to a life of drugs and alcohol. It would be very easy to say, “That boy is out.” Well, God understands that boy’s heart and life. For that matter, God understands the heart of the priest who abused him. I think it’s time for us to get out of the business of judging. It’s easy to be a Christian in America. It’s really easy. But I think that most of us, if we grew up in a devoutly Muslim household in Afghanistan where 98 percent of the people are Muslim, would be Muslim. That’s just the reality of it. And for us to pretend that God doesn’t love those people because they happen to be in that situation is putting our own narrowness on a God who is bigger than we are. That is not to say that everything is good and everything is accepted and we’re all in. But I’m not going to pretend I know the answers to all the questions. And I think it’s disingenuous for us to claim the God of the New Testament and the covenant of love and forgiveness, and at the same time turn our own backs on people who haven’t had the opportunity to understand what that means. I like that line about us getting out of the judging business. I think that’s part of the concept of giving up on trying to control the outcome. I know what I know, and I have accepted what I don’t know. And I accept that there are things that are above my pay grade. It’s not my job. I have jobs to do on this earth, and my job is to try to figure out what they are and to do them to the best of my ability. I will let God be God. That’s really hard. I’m a type-A personality. I’m a planner. I control things. You don’t get to be “successful” in our culture without being a controlling kind of person. That’s the challenge, I think. I’m still a planner. I still organize. I’m still that kind of person. But I truly want, every minute of every day, to give up the outcome, to truly let God be God. With her capsized kayak pinning her under the surging water, Neal was believed to have not been breathing for anything between 15 and 25 minutes, according to the kayaking guides with her on the trip. During the time of what she terms her “drowning,” she claims to have had a heavenly experience in which she returned to God and was in the presence of Jesus and angels. It was a life-changing event for a person who was not fervently religious. The incident also prompted Neal to write her best-selling book, “To Heaven and Back: A Doctor’s Extraordinary Account of Her Death, Heaven, Angels and Life Again,” which spent several weeks atop The New York Times’ “Paperback Advice & Misc.” best-seller list. A spinal surgeon from Wyoming, Neal suffered two broken legs and lung problems as a result of the incident, spending a month in the hospital and missing six months of work while in a wheelchair. As a doctor, she is used to having a biological explanation for near-death phenomena like bright lights and warm feelings, but believes this was a different situation. Neal claimed that she survived because she was told by God that her family would need her in the face of an impending tragedy and that the world needed to hear her story. She was told her son, Willie, who was 9 years old at the time, was going to die, but was not given specific details. In 2009, Willie was killed in a car accident at 19 years old in Maine by a male driver who was on his cell phone. She also is comforted by the notion that she will see her son again in the afterlife. Lauer raised the question of why Neal was able to return to life when many others die in similar situations, and she admitted that in the moment she did not want to return to life. Neal describes being in the presence of angels and Jesus as more of a feeling than actually seeing images of their faces, although she told NBC News she recalled seeing a large, domed structure. She believes Jesus helped guide her through the near-death situation before rescue workers were able to revive her. By Mary C. Neal M.D.